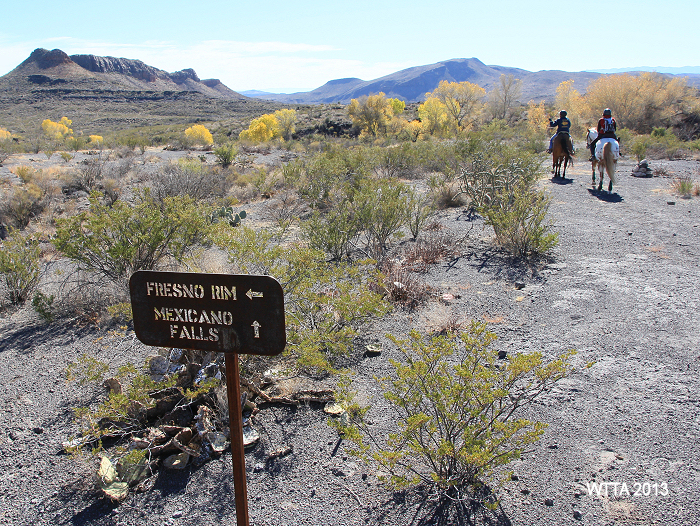 Directions: The entrance to Big Bend Ranch State Park is located at Farm to Market Road 170 and Casa Piedra Road. There are two separate directions you can come from to get to the park entrance. From Alpine take 90 west to Marfa. Once in Marfa take 67 south to Presidio. Once in Presidio take FM 170 southeast for approximately 6-7 miles and then turn left onto Casa Piedra Road, look for the brown state park sign. This is the route we traveled. Traveling south on 118 from Alpine going towards Lajitas turn right/west on FM 170. Travel through Lajitas and continue on 170. From Lajitas the park entrance is another 43 miles south on FM 170. This route includes a 15% grade, which is very steep. Climbing and descending the hills on this road with a loaded horse trailer will challenge all but the most powerful trucks and requires sharp driving skills. Once in Reford there will be approximately eight more miles to go before getting to FM 170. From FM 170 turn right onto Casa Piedra Road. This route is one of the most scenic roads in Texas. Again, I don’t advise hauling a horse this way, but you may want to try and make this drive without your trailer just to take in the scenery. Cuevas Amarillas rock overhang shelter. 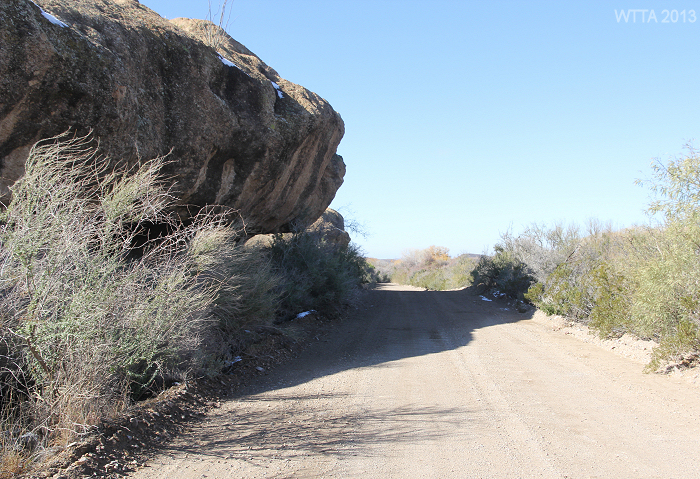 When turning onto Casa Piedra Road from FM 170 it is about a 26 – 27 mile drive on a gravel road which is rough and not well maintained in areas, to get to the park headquarters at the Sauceda Ranger Station. The entrance road starts out as a fairly wide well maintained gravel road, it later narrows and becomes rough, then once closer to the headquarters the road begins to improve somewhat. Travel approximately 6 miles on Casa Piedra before coming to a T or split in the road, go to the right. Travel approximately 1.5 miles before coming to a split in the road and go left. Travel for 9-10 miles and then you will come to the large park entrance sign (you can’t miss it), continue straight and on the main road. Just after passing the large sign there is a vault (chemical no flush) toilet on the left. Follow the signs and stay on the “Main Park Road”. A few miles after passing the main park sign entrance look to the right for an extremely large boulder overhang formation. This is a neat place (Cuevas Amarillas rock shelter) to stop as there are pictographs and maize grinding holes hidden under the shade of this huge rock. 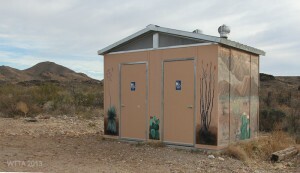 Further down the road you will pass Agua Adentro Pens, an equestrian campsite, on the right, providing another opportunity to use the mural painted restroom (vault toilet) if needed. On the Main Park Road you will notice mile marker signs which gives you an idea of how much further you have to travel to reach the headquarters. 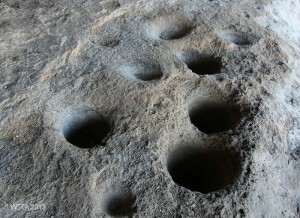 Maize grinding holes hidden under the shade of Cuevas Amarillas rock. I recommend getting a map of the park ahead of time to help with navigation. I like the Big Bend Ranch State Park Discovery Map, it is large, very handy, and even has the electrical lines, railroads, fences, and contour lines, among many other items marked. The road narrows, gets very rough in spots, crosses cattle guards, and inclines/descents which are a bit steep at times but doable. We were in a one ton dually pulling a three horse trailer with an approximate 12 foot living quarters. The speed limit is 25 but you will have to go slower than this, especially if you are hauling a trailer. You will also go over low water crossings which are usually dry. I noticed on one of the low water crossings the road was eroded away on the right leaving about a one and a half foot drop off on the edge. I would not recommend making this drive in the dark if you are pulling a trailer or unfamiliar with the area. Pay extremely close attention to the signs and map when entering and exiting the park, as a wrong turn could get you miles off course and you don’t want to haul any further than necessary on these roads. Big Bend Equine Center in Alpine, TX. 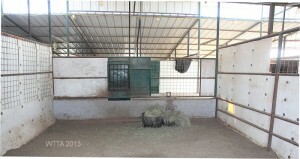 Angel’s stall at Big Bend Equine Center. 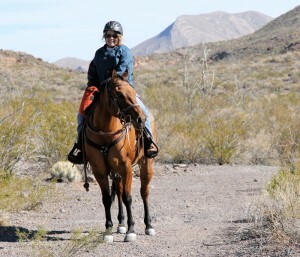 I highly recommend finding a place to stay with your horse the day before heading into Big Bend Ranch State park and the day after leaving the park. We stopped on our way in and then on our way out of the park in Alpine and boarded the horses at Big Bend Equine Center – www.bigbendequinecenter.com. They have a nice barn containing large covered stalls with outdoor runs and if you provide them with your horses feed then they will take care of all their needs. Freddy took great care of Angel and her buddies and the horses got to rest up before the long haul from Alpine to Big Bend State Park. Big Bend Equine Center also has an arena and round pen. You also have the option to camp out on the center’s grounds in your living quarters trailer, but I don’t believe they have hook ups. We rested up at the Highland Inn for a very reasonable price while the horses enjoyed the equine center. Carol is out of control! During this respite we thoroughly enjoyed Alpine; my good friend, an Alpine resident, was happy to give us a tour, thanks Karen! 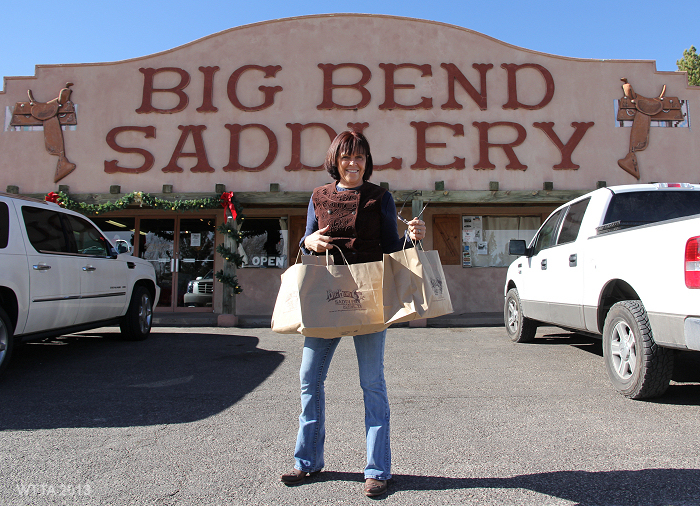 We especially enjoyed eating breakfast at Bread and Breakfast Bakery & Cafe and shopping at Big Bend Saddlery. Alpine is a fun city to visit and staying there one night before going in and after coming out of the park is a great way to rest up both you and your horses from that long bumpy haul in and out of the park. 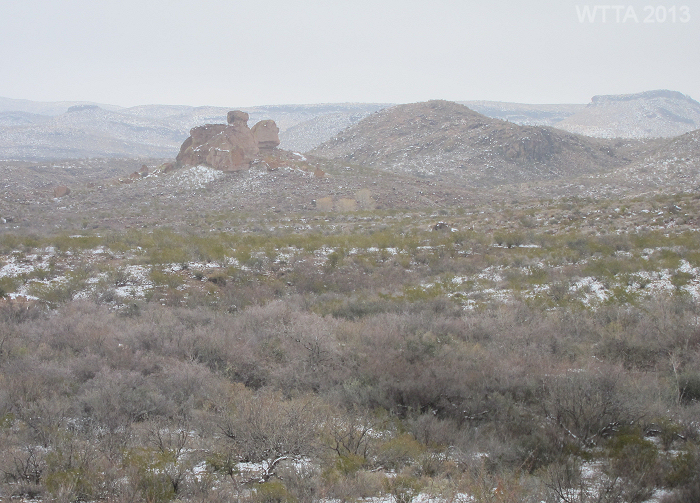 Although Alpine seems close to Big Bend Ranch State Park it is not an easy drive, especially when considering the 26 -27 miles of unpaved park road into Sauceda Headquarters. On our way out of the park we planned on getting diesel in the nearest town to Big Bend State Park, Presidio, but we had a bit of a scare. The sign said they were out of diesel and after much searching we learned there were no other gas stations in town that served diesel. We were not sure we had enough fuel to get to Alpine. So we waited, as the store staff explained they should be getting a tanker trailer of diesel in sometime that day but they did not know what time exactly. After explaining to the manager that we would not be able to leave for Alpine until we were able to get some diesel he explained that their tank was not completely out but they closed the pump because once it gets low it pumps very slow. We explained that we did not care how slow it pumped just so long as we could get some out. Luckily there was enough to get us to Alpine! So in retrospect I recommend bringing at least five to ten extra gallons of diesel on hand when traveling to Big Bend Ranch State Park. 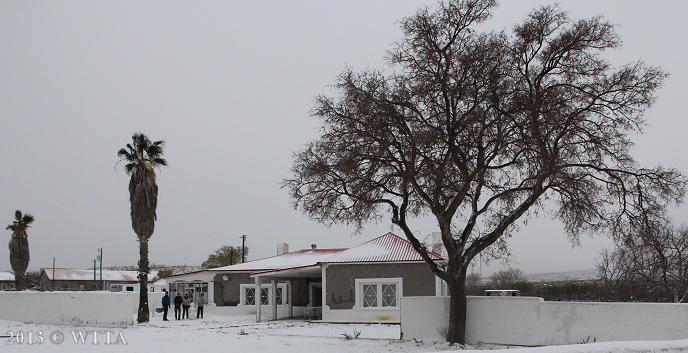 Sauceda Headquarters covered in snow. One of the many perks of this rugged and remote park is that you do not have to rough it if you don’t want to. Of course there is primitive camping but the comforts of a warm bunkhouse and house are available for reservations. At the park headquarters office, aka, the trading center, there is running water with restrooms and showers. In the office is a store and a type of mini museum with artifacts and interesting information. Human facilities include primitive campsites, the Sauceda Bunk House, and the Sauceda Big House. Primitive campsites are located all throughout the park and are just that, primitive, with little to no facilities. At some of the campsites there are chemical toilets. Equine Campsites: According to the state park website there are six campsites in which you can bring your own horses, some of which have a water supply and corrals. Sauceda Headquarters: If staying at Sauceda Bunk House or the Sauceda Big House you can keep your horses in the corrals located near the barn, which is adjacent to the big house and not far from the bunk house. This is where we kept our horses while I and my friend Carol stayed in the bunk house. 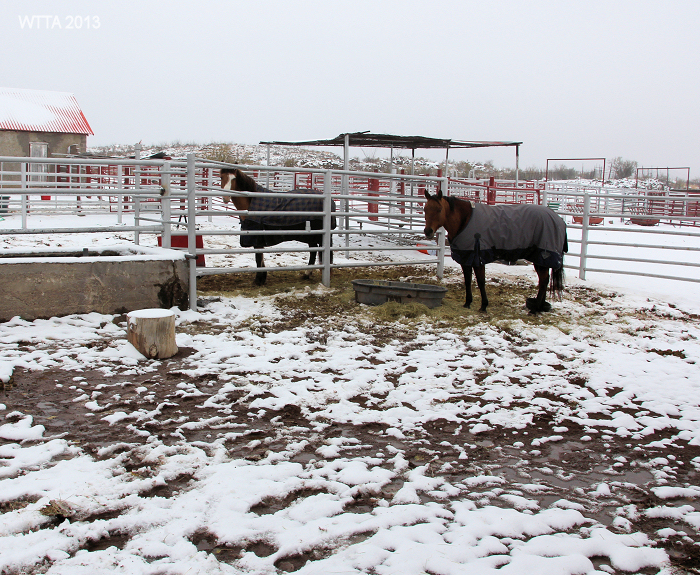 Our friend, Kelly, was able to plug in her living quarters trailer into the barn outlet and be right by the horses. However, this was not an RV plug so it did not run everything. She was also able to run her generator. The pipe corrals were adequate but did not provide protection from the weather. I also had to move a few items, like metal t-posts and other debris out of the corral, to make the area safe for my curious horse. Agua Adentro Pens: Located along the 2WD main park road which accesses Sauceda Headquarters, this site consists of three large shade shelters, several livestock corrals with an active water trough, a water tank, three fire rings, picnic tables, and a dry vault toilet. There is plenty of space to maneuver large rigs. Located in the west-central part of the park, the site offers unlimited access to miles and miles of ranch roads and trails to explore. Escondito Pens: Located near Sauceda Ranger Station, this site is approximately two miles off of the main park road on a 2WD high clearance road. The site consists of woven wire pens, an active spring fed water source, two shade shelters, picnic tables, a dry vault toilet, and two fire rings. Fresno Campsite: Located in the bottom of Fresno Canyon, this site is accessible by a 4WD road. No horse trailers are allowed. It is necessary to ride to the campsite, but camping gear can be hauled in with a 4WD vehicle. The site consists of 2 hitching rails, 2 picnic tables, and 2 fire rings. There are no corrals at this site. Seasonal water may be located approximately ¼ mile from the campsite where livestock can be watered; otherwise, plan to carry in water for your horses. This site though primitive, will get you near the west side of the Solitario and the historic Fresno Canyon. Javelin Pens: Located on the rugged 2WD high-clearance road known as the Madrid Road. Pulling a horse trailer is not recommended. The site has remains of pump jacks and other ranching artifacts, and an operating well. The site also consists of woven wire pens, 2 picnic tables, and a fire ring. Non-potable water is available. The Rancherias trail and the heads of several canyons are near this area. The Sauceda Bunkhouse, a former hunting lodge built in the 1960s, is large with segregated sleeping areas and bathroom/showers for men and women and a central living/dinning space. 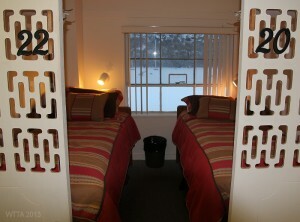 The sleeping area can accommodate about 60 people and consists of a a hallway with rows of twin size beds on each side of the hallway. There is some privacy as two twin size beds are in a type of nook or cubicle with a thin wall between the next set of beds. An opening/doorway with no door or curtain and lattice work with a handy high shelf is located above the foot of the bed. There is a light above each bed and one outlet for each cubicle/nook. This is a small but cozy space. On one side of the hallway the cubicles have mirrors and on the other side the cubicles have windows. The living area is open to the dinning area. The living area consists of three leather couches and a large chair with end tables and a coffee table. There is a large TV on the wall with a VHS and DVD players. A fireplace is also available for use in the living/dining area, but was not being used during my visit. In the dinning area there are several large tables with chairs, a coffee machine, water dispenser, a microwave oven, and two refrigerators with clear glass doors (this is where guests can store their food). Coffee, silverware, and styrofoam cups are available. A kitchen is also in the Sauceda Bunkhouse but it is only opened to park cook staff who prepare meals for the guests. 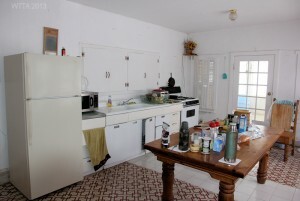 Guests cannot use the kitchen to store food or prepare meals for themselves. Suaceda Bunkhouse also has a large front porch with plenty of seating. 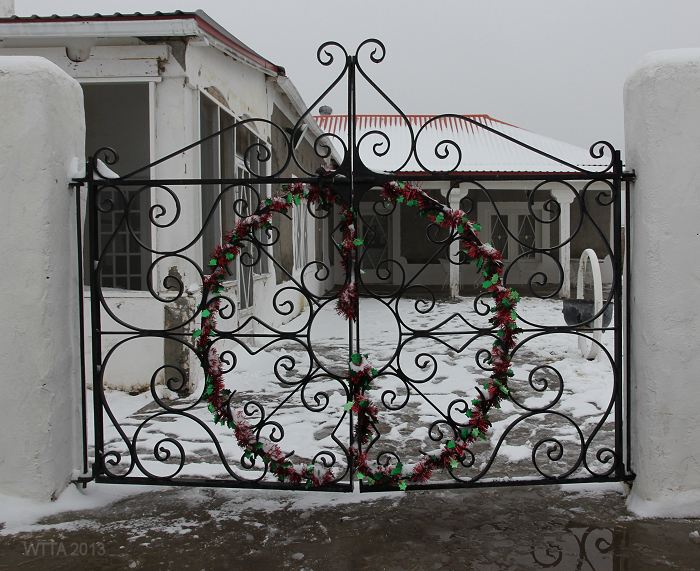 Sauceda Bunkhouse is located on a hill and overlooks the park headquarters. Reservations must be made ahead of time at the bunkhouse and the price is very reasonable at $35.00 a night (does not include meals). The Big House viewed in normal weather conditions. 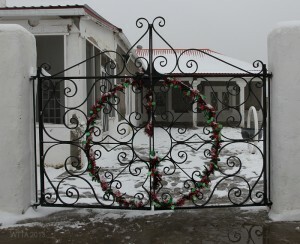 The Big House viewed in abnormal weather conditions. The rustic Sauceda Big House is a unique and historic home built in 1908 and remodeled in the 1940s. This is a three bedroom home. One room has a queen size bed while the other two rooms each have two full size beds. There are three bathrooms, two of them have bathtubs and the other has a shower. There are several fireplaces throughout the home. Each room can be reserved for $100 a night for one to two people and $50 a night for each additional person (does not include meals). During my stay in the park one family had rented out all three rooms in the Big House and seemed to really enjoy the house and park. They were kind enough to show me around so I could photograph the home. The home has a working kitchen and dining room. Guests can chose to prepare their own meals or purchase meals ahead of time and dine at the Sauceda Bunkhouse, which is a nice walk across headquarters just up a hill. Meals: Breakfast, lunch, and dinner are prepared at the Sauceda Bunkhouse kitchen by park staff and are available to guests, but you must purchase the meals ahead of time. During my stay in the bunkhouse I found the food to be delicious. Breakfast mostly consisted of bacon, eggs, or pancakes. I did not have lunch because I brought my own food to pack out on the trails for lunch. Dinner was my favorite meal and ranged from home cooking to delicious Tex-Mex cuisine. Call the park for meal reservations at 432-358-4444. All meals will be paid in full (non-refundable) by phone prior to arrival. Note: From May 1 to August 31 the kitchen will only open when reservations have been made by a group of 10 or more. For parties of less than 10 persons, frozen microwave meals will be available for an additional charge. Be sure to check with the park for accurate fee information as this is subject to change. Park entrance fees vary depending on if it is peak season. Hunting is allowed in the park during certain times. Extremely poor to nonexistent. Verizon can get some poor service. I have AT&T and was unable to make a phone call. I could send a few text messages with difficulty; it is not reliable. 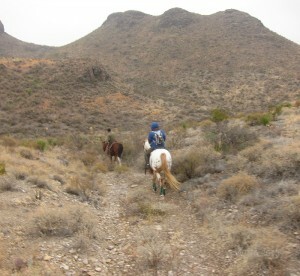 Big Bend Ranch State Park provides miles and miles of trail. 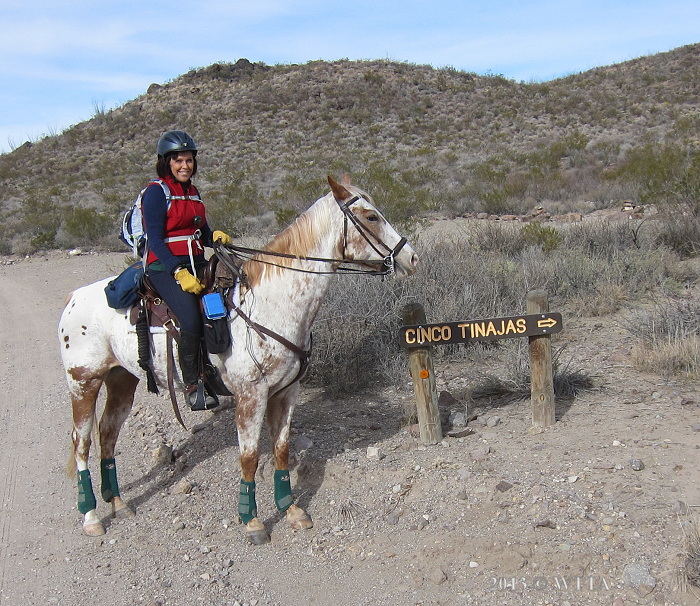 Kelly Brough and Whiskey near Puerta Chilicote trailhead off the Llano Loop. Exact total trail mileage is unknown but there must be over 100 miles of trails in the state Park. I also heard of a group of men riding their mules from Lajitas to Sauceda Headquarters. They must have a great deal of experience in back country camping or they may have hired a guide. The state park offers an eclectic range of easy to extremely difficult and rugged trails. The main roads are the easiest trails to travel. The jeep trails offer some inclines and are slightly more rugged, and the one track trails can range from mild to extremely difficult. The dry creek beds or arroyos offer a break from the rocks with fine dark colored sand which is deep in spots. This is a vast mountainous rocky land so shoes/boots are a must for your horse. The land is very dry as well so be sure to bring plenty of water along. Ask the park rangers if they know where or if there will be water on the trails you plan to ride for the horses. I was only able to cover a tiny portion of the largest state park in Texas. But from what I saw the trails markers are placed at main junctions by the main roads or jeep roads and once away from the main cross roads there were no markers. Bring your map, compass, GPS, or even better book the park guide, Raul. Trails are shared by hikers, equestrians, cyclists, and motorized vehicles to include dirt bikes and ATVs. However, with the exception of the first day when we saw some hikers high along a ridge line, we saw no one else on the trails – this is a BIG park. Carol and Bug in front of an old water tank. 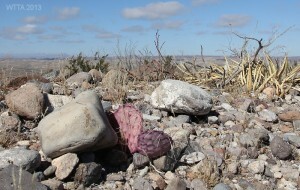 Purple Cactus at Big Bend. 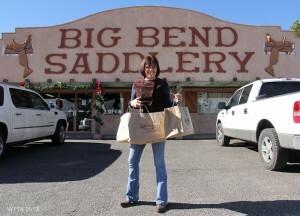 We arrived at the largest state park in Texas, Big Bend Ranch, on New Years Eve Day. The trip to this park alone is a another tale. Our friend, Kelley Brough, was a pro at maneuvering her dually which was hauling a fully loaded three horse trailer along the 27 mile unpaved park entrance road while keeping our precious cargo safe. 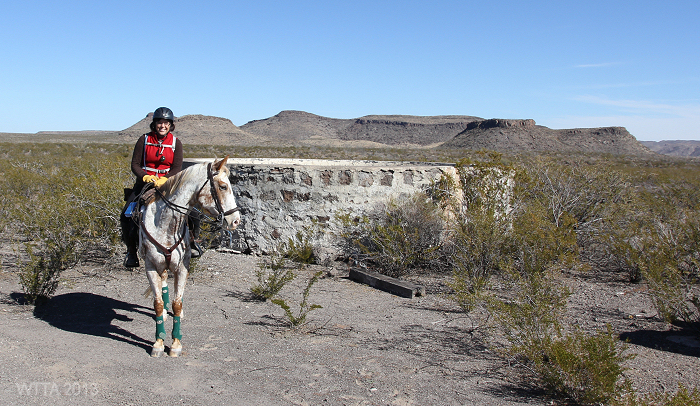 Staying at the cozy Sauceda Bunkhouse was certainly the way to go for myself and friend, Carol Grosvenor; enjoying the comforts of a soft warm bed, soothing hot shower, hot meals, and good company by night while riding through the harsh Chihuahuan Desert by day. Big Bend Ranch offers many accommodations for visitors such as the cozy bunkhouse, the historic Big House, primitive camping, or you can chose to stay in your trailer but there are no standard RV hook ups. We all ordered breakfast and dinner from the kitchen at the Sauceda Bunkhouse and packed out lunch for the trail. Enjoying a warm breakfast and dinner prepared by someone other than myself after a long ride was definitely a wise decision. I loved not having to fuss with cooking and packing lots of food, plus the meals were delicious. When we first arrived the bunkhouse was packed with off road motorcycle enthusiasts, evidently they plan a yearly get together at the bunkhouse. They were an eclectic group from all over, from Texas to Alaska. This was their last night and fortunately for us only a few were going to be biking on the trails the next day. We made sure to enjoy different sections of the park since horses and motor bikes usually don’t mix so well. They were a very friendly boisterous bunch and we talked about the trails and got to listen to Brad Collins share some tall tales. Brad gives motorcycle riding lessons at Hidden Falls, located in Marble Falls, TX. He also describes himself as a professional story teller and “third best liar in Texas”. The yarn he spun about breeding pairs of armadillos that lined danced and dug post holes was my favorite! The following morning, after filling up on biscuits and gravy, bacon and eggs, and canned peaches we celebrated New Year’s Day in the saddle. From the ranger station we rode west on the main entrance road and turned right at the Cinco Tinajas trail sign. For a short ways we rode through an arroyo and then followed a trail to the left curving up a rocky hill and back down into another dry creek bed. 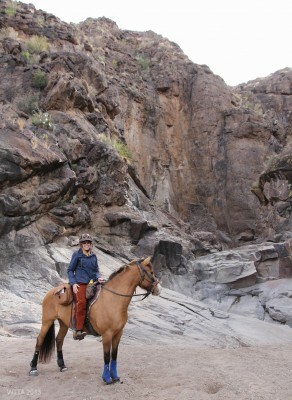 To our right the arroyo met its end at the base of a statuesque canyon wall. Curiosity compelled us to ride on to the canyon base, but all three of our horses objected and seemed to believe there was surely a creature of doom lurking in the shadows. Looking up I learned what caused our horses’ hesitation, several tiny silhouettes; hikers, could be seen along the lofty ridge. This was the only instance we ran across other trail users during our exploration of the park trails. Hidden in the canyon’s shadow revealed one of the Cinco Tinajas. A Tinaja is a shaded desert water basin carved out by runoff carrying abrasive sand and rock. The deepest Tinajas hold water even in the driest times; knowing the location of such a resource was vital in the frontier. We admired the view for a moment then double backed, following the arroyo and taking a right at the glutch. Heading in a new direction down the sandy arroyo armed with map and compass we enjoyed the vastness of a 300 thousand acre park. Getting turned around was a slight concern of mine, but my friends were handy with the their map and compass which showed our path was true. Navigating the arroyo was a bit tricky, in spots our forward travel was blocked by formations of boulder like rocks, which would have produced little water falls had the creek not been dry. We took our time finding the best ways around or up the rock barricades; our horses did great! As we went along, my horse Angel alerted me to movement ahead. I caught a glimpse of a Javalina tail disappearing into the brush. At my second glance he was safely on top of the hill; swift creatures. The little arroyo lead us to a well defined jeep road leading us back to the main park road and then headquarters. Our trip turned out to be an 11 mile loop ride. To top off my New Years day, my old high school pal, Karen Caswell, and her family stopped by for the late afternoon and hung out with us. We gave her and her three kiddos a ride on the horses. rugged country. The trail itself was mostly tame two track level dirt to gravel roads. Along this route I saw numerous disturbances in the soil which appeared to be cattle prints. Big Bend Ranch contains herds of Longhorn cattle; this was the only signs I saw of them. At one point we halted our horses and kept quiet, drinking in the silence. Our horses’ rhythmic breathing was all that could be heard. We decided to use the services of the park’s longtime renowned guide, Raul, on our third day’s excursion. Raul has worked at the ranch for years, is quite the hand, and knows the trails better than anyone. The weather decided to become unpleasant with strong winds and light sleet. 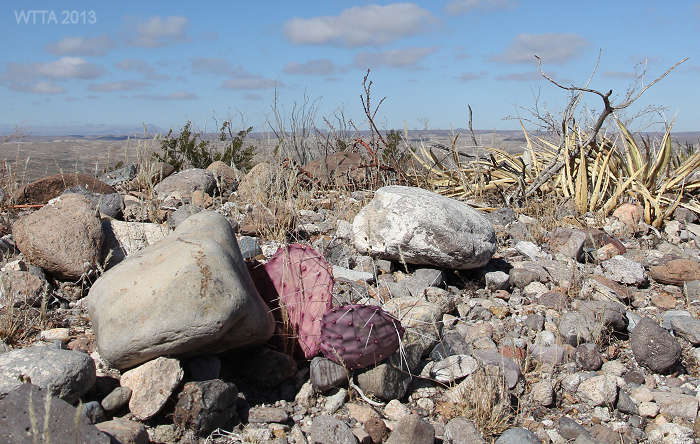 I could not even begin to explain where Raul took us, it seemed more like bushwhacking up the side of a mountain, through deep gullies, across ravines, and zig zagging rocks and cactus. The terrain was rough. Raul said we were on an old coyote trail which has not been used for years. I was thankful to have chaps and a raincoat on. This fair weather rider was happy to have pushed myself to ride in the unpleasant weather, as the views and exploring remote trails was worth a bit of discomfort. The following day, our last day of riding at the park, we awoke to a winter wonderland. 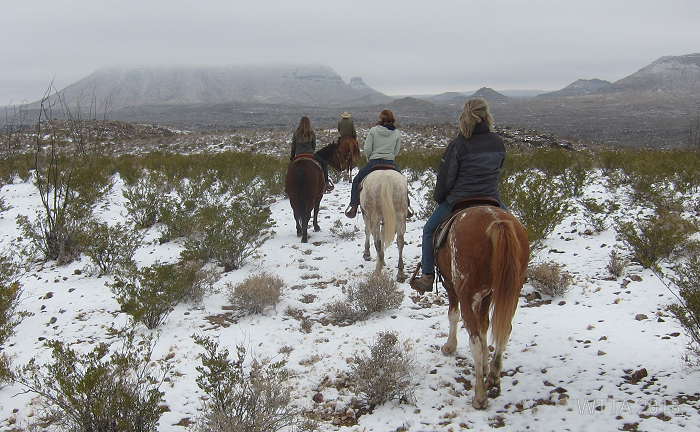 Snow had blanketed the ranch making for spectacular views. I was anxious to ride in the snow, something I’ve never done before. 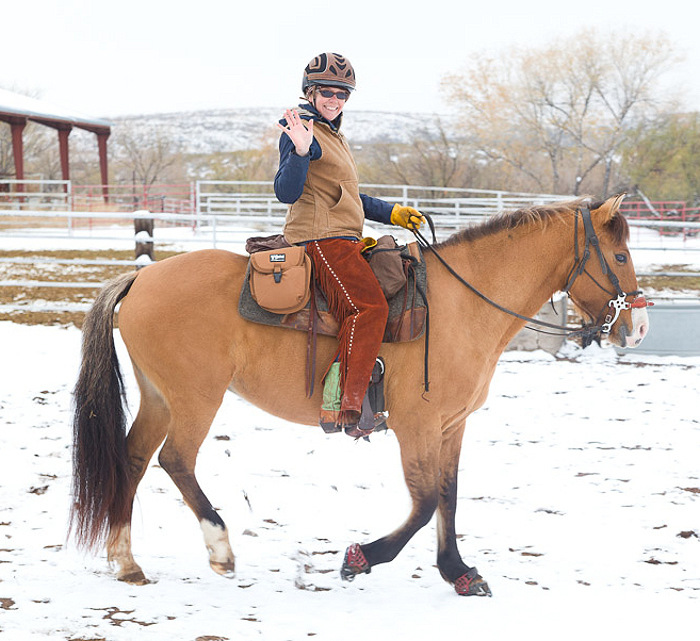 However, my friends’ shod horses were unable to be ridden due to the snow balling up in their shoes and making them look like they were walking on high heals. My horse, Angel, is not shod and I use boots, which preformed well in the snow. Feeling disappointed for my friends and a little insecure about riding out in 450 square miles of rugged unfamiliar country, I figured I’d just be doing a short ride around the headquarters. However, I got lucky, Raul was taking a group of three, a friendly women and two teenage girls, out on the ranch horses for a trail ride. I was welcomed to tag along! 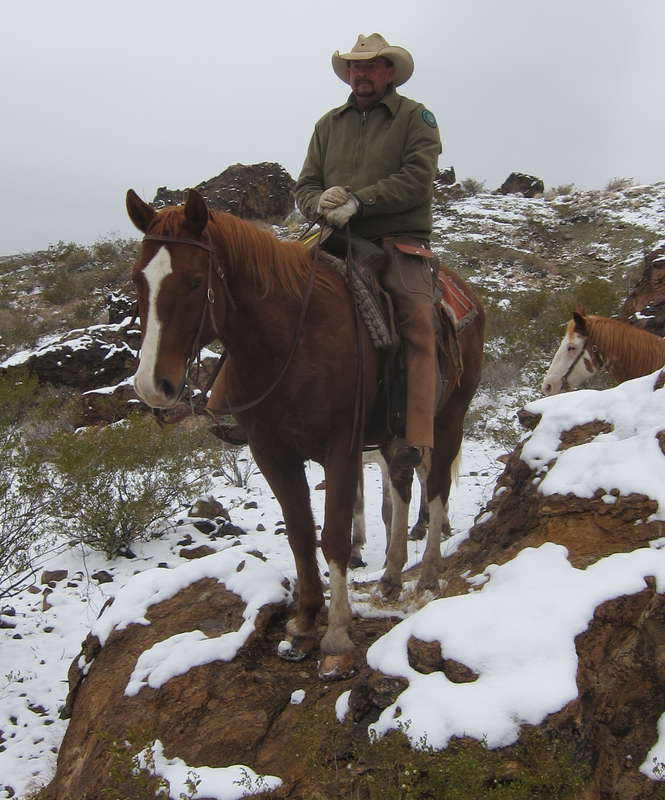 This last ride was the piece de resistance, riding in the snow covered Chihuahuan Desert, seeing the ominous flat top mountain, La Mota, blanketed with snow, galloping along the deep sandy arroyo, seeing red pictographs along the side of a boulder, and riding to Los Banos De Leyve. I thoroughly enjoyed my time in the vast wonderland of Big Bend and look forward to returning to the Biggest State Park in Texas. The rugged trip into the park is well worth it. Raul, long time experienced state park hand and guide, shows off his horse’s ability by stepping him up on a large rock.